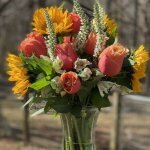 A beautiful flower bouquet that will delight your loved ones! All flower bouquets are filled with a variety of seasonal fresh flowers! Flowers will vary depending upon what is in season and fresh!